Sound art from Dubai for their friends in Espoo! First, we watched a video about how our ears receive sound waves. 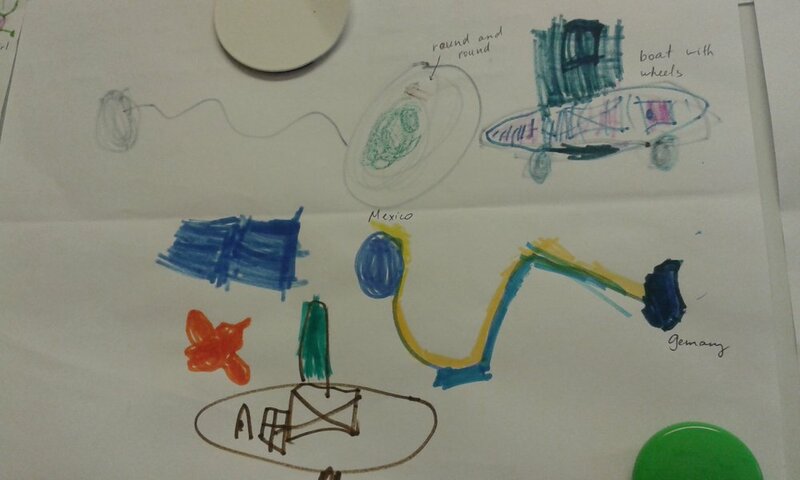 The children had learned already about the 5 senses so we asked ourselves: which of these senses do artists use? Then the students closed their eyes and listened while I made sounds with different items. We tried to draw those sounds using different types of lines. Then we sat outside and listened to the sounds we heard: birds, planes, cars and trucks, helicopters, children playing, footsteps. 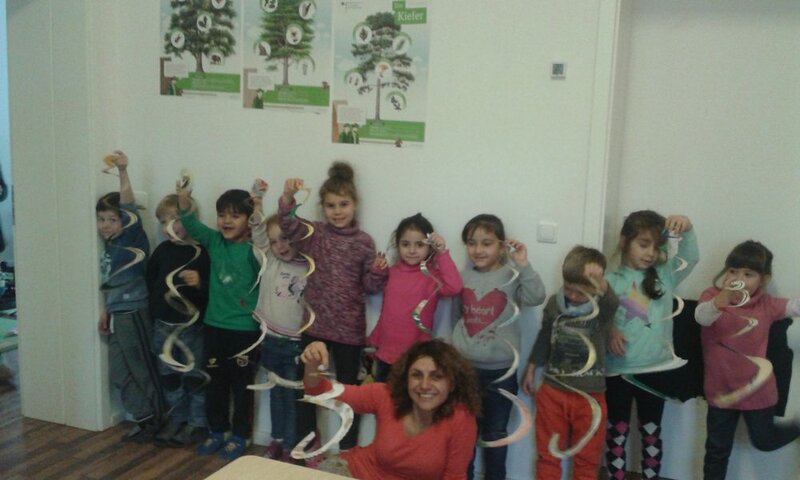 In the second class we talked about the idea of things that happen “earlier” and “later” and spoke about activities we do in these periods. We tried to remember and predict “earlier” and “later” activities and to draw them. Below are selected artworks from KG2E. The kids found listening to the sounds outside really fun. Sometimes it was hard to remain quiet and just listen but then we enjoyed the process. What did your kids think about it? Was it challenging? Trying to draw the things that makes sounds from earlier and later periods was a bit tougher for us but we liked thinking about all the things we do outside of school. We drew things like brushing our teeth, playing, eating, and driving in our cars. In Dubai we have to do a lot of driving because the city is big and spread out. We also have big high ways. What is it like in Helsinki? What animals live there? Do you walk, or take buses or trains to school? What is the weather like? We can sit outside now in shorts and t-shirts in Dubai but soon it will be too hot. 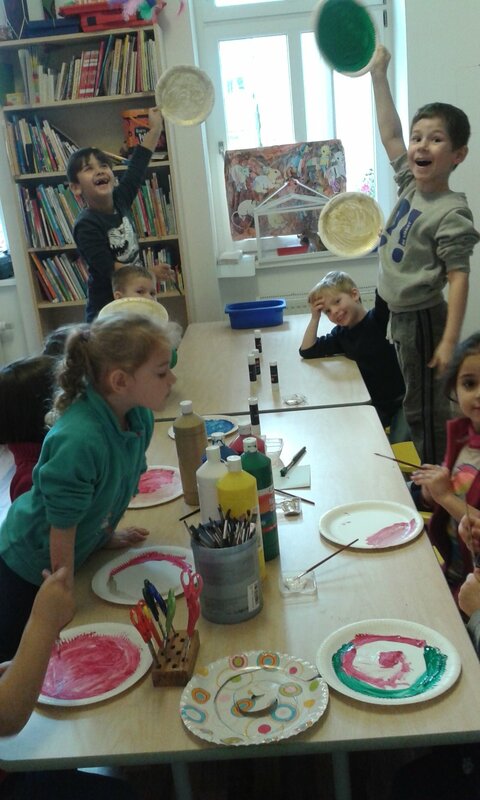 KG2E class from Collegiate American School in Dubai, United Arab Emirates are making and sharing art with the Tigers from Your School in Espoo, Finland. 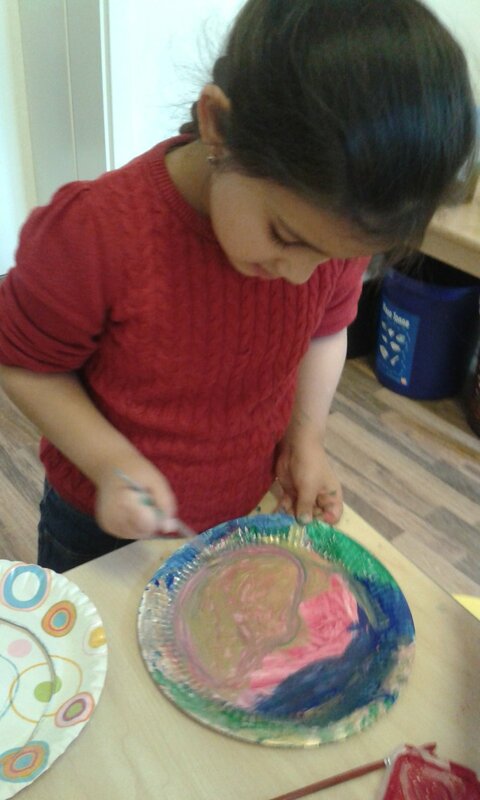 KG2D are making and sharing art with the Monkeys. 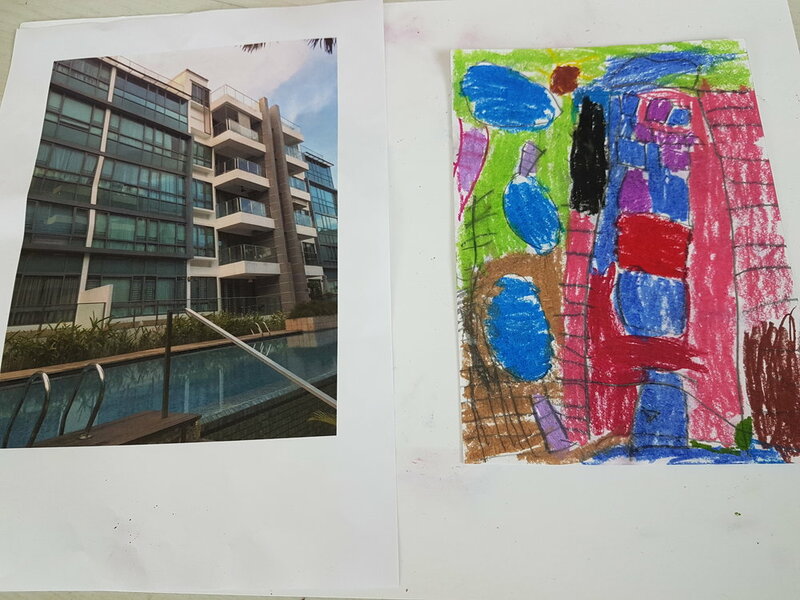 The young artists are 4-6 years old. The Tigers are very excited to meet their new friends from Dubai in the United Arab Emirates! They first asked where it is located on the map! Some of the Tigers have even been to Dubai, but don't remember because they were 3 years old at the time. But they imagined that it was a great place : ). After going over where our friends live we talked a bit about different ways to share our space with our new friends. Sharing with our friends what we find in our soundscape, we decided, would be fun to do! Toti and the Tigers were listening to different sounds and paying attention to local sounds earlier in the day as a way to warm up their ears. Misk- I hear the wind in my heart. Mike said, "I heard life, the wind." When Vihan saw Mike's picture he said that it made him feel like he was in a tornado. How do you feel when you see this picture? 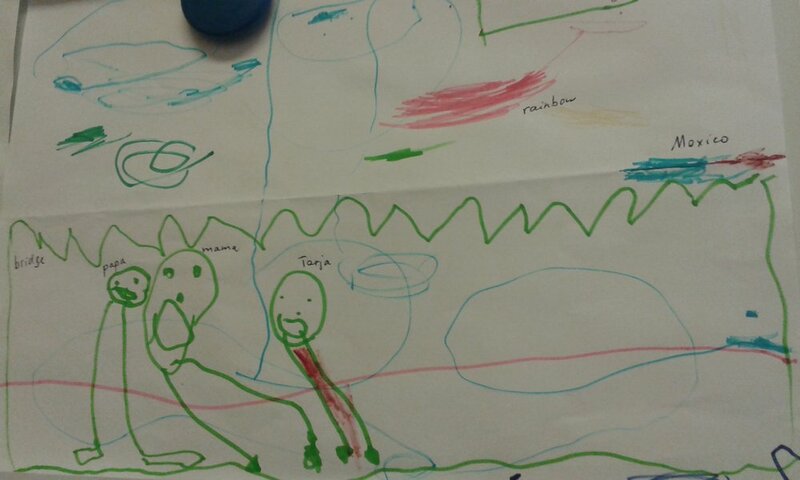 At night time, V hear's that his daddy is tired so he drew a picture of Daddy yawning. Adn, "Rainbow, rain, trees, gold coins found in the morning. Arya- It was easier to draw blindfolded. I heard the blood in my body. Ath- I heard the monkeys. Lil- I heard my heart beating. Daddy sleeping and snoring. D- I heard the Monkeys laughing. R- I heard the wind. The Tigers said, "Dear friends, we would like to invite you to Finland! Far and close from us. N heard birds in the morning! Happy New Year!! We received your projects!! We are so excited, we received your projects and we loved them!! Thank you so much, we hope you enjoy our projects too. Did you receive Elmer? We have a special place for all your artworks. The Tigers make their way to Mexico! I was so very impressed with how imaginative the Tigers were! Some even made a three-dimensional boat to travel to their friends in Mexico! Before getting started on the artworks we first had a good conversation about what vehicles were and how different vehicles travel. The Tigers then decided to try to make some that fly, float, and go underwater! The Tigers collected ice cream wrappers and candy wrappers from a recent birthday party to use for the collage. Have you ever had Penguin ice cream? We have been getting to know ourselves and the world through making art. 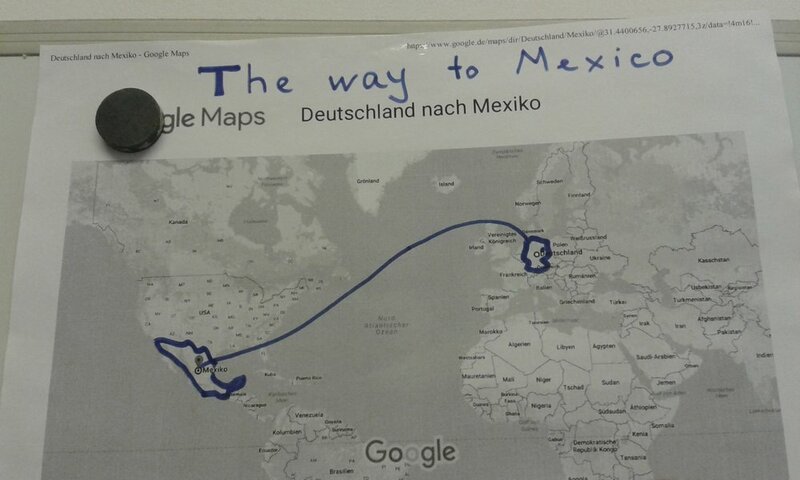 Now let's put all the pieces together and make a collective piece of art which shows different ways to get to our friends in Mexico! 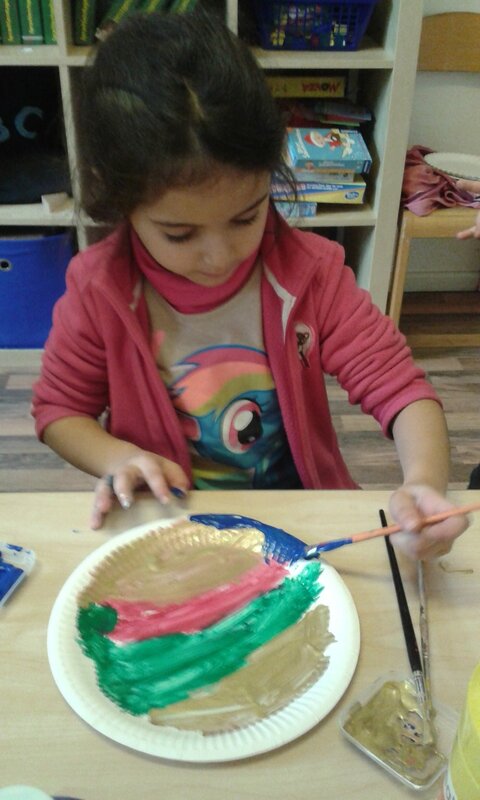 As we were using recycled materials, the artists realized that this was also a sensorial experience! They smelled the empty coffee bags and thought that this could help with the travels :). Some K1ers said that Mommy likes to drink coffee. Submarines, flying helicopters, jets, and more! Here's a panoramic view of K1's world! A school of fish create a sea of inspiration! The artists in Finland were very excited to have received their artworks from Mexico! When they saw the fish we thought it would be great to create a collective piece of art and make a giant ocean. You will see colorful fish, mermaids, ships, and sharks! Thank you, Ms. Laura Garza and Prepri A, the group of 6 year old artists from San Patricio Colegio in Monterrey, Mexico. Tigers are grateful for their gifts from Mexico. And then make more art! The Tigers were so very happy to receive artworks from their friends from Mexico!! 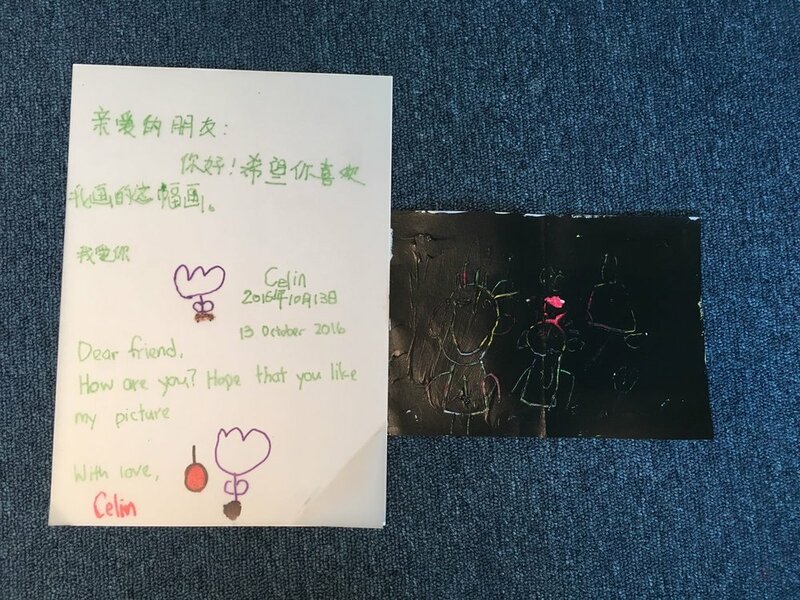 We read their letter and then proudly put their artworks on the classroom wall. Gracias amigos! For the Look around project we started off by revisiting where our characters live. When we stepped out of our character's home, What did we see? What was there? What was the environment like? Everybody's imagination took them to a different place! We thought about what this environment looks like in the daytime and at nighttime. Using wax crayons and watercolors, we made our imagination come to life!